When professional truck drivers first discovered the exceptional noise canceling technology of BlueParrott headsets, news of BlueParrott’s sound quality spread rapidly. Today, BlueParrott has only gotten even better. The B250-XT has an increased talk time of 16+ hours and standby time of up to 150 hours. 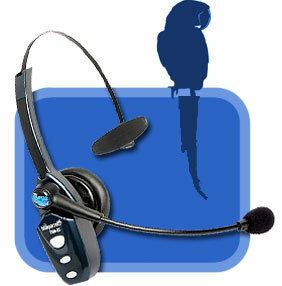 BlueParrott still has the same reknowned VXI noise cancellation. VXI's Xtreme Noise Suppression is so good it can block out the sound of an 18-wheeler’s engine. Other new features include indicator light turn-off and multiple device pairing. Lightweight and very comfortable, the B250-XT is durable enough to withstand life on the road. The stable over-the-head wearing style stays in place and the flexible "gooseneck" boom allows positioning of the microphone close to your mouth for superior voice quality. The BlueParrott B250-XT is a professional grade wireless Bluetooth headset. The headset is worn over the head via a headband and head rest on the opposite side. The headset microphone is positioned at the corner of the mouth for a clear, noise-free signal. The B250-XT headset pairs to other Bluetooth enabled devices such as cellular phones (works with Verizon, Sprint, Nextel, Alltel and U.S. Cellular) and computers using handsfree and headset profiles.